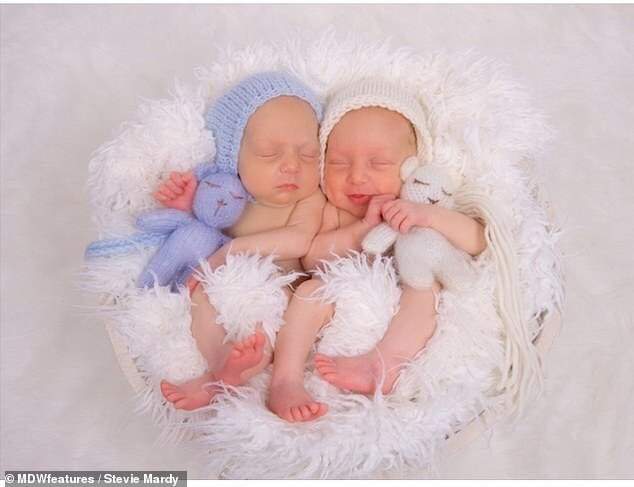 Twins have defied the risk of death in the womb due to a rare condition which led them to share the placenta. 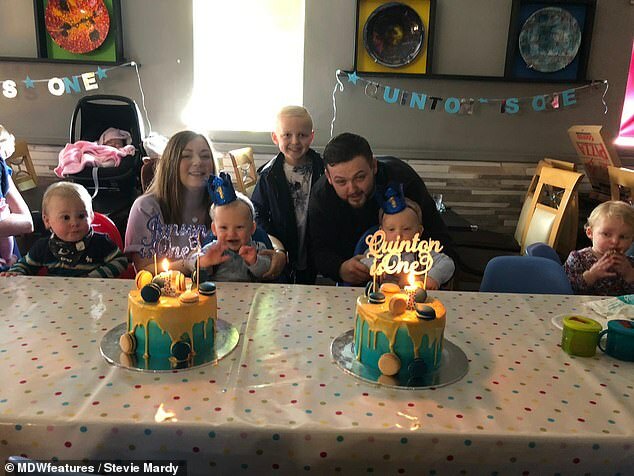 Stevie Mardy, 28, and her husband Karl Mardy, from Leeds, were told by doctors that it was likely that one or both of their unborn twin boys would die. They had a condition, known as monochorionic monoamniotic (MCMA), which could result in the tangling or compression of the umbilical cords. The couple only knew of the condition because Mr Mardy’s mother had twin girls who died from MCMA in the past, which added to their fears. 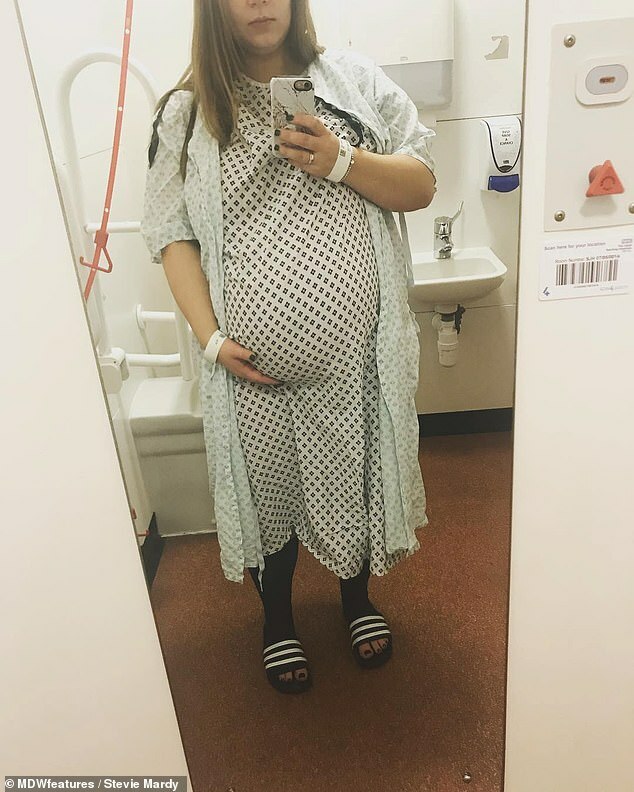 The next 32 weeks were filled with anxiety as doctors kept a close eye on Mrs Mardy throughout her high-risk pregnancy. 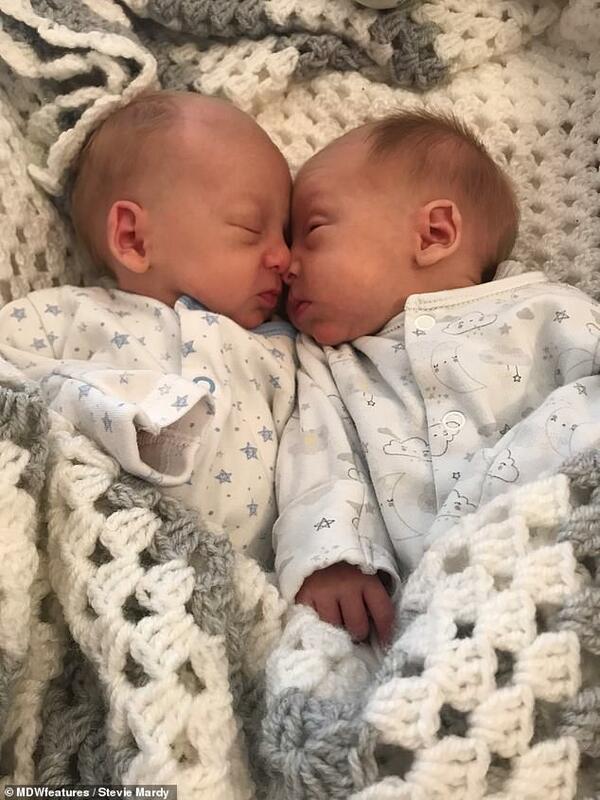 The boys, Jenson and Quinton, were born via C-section in February 2018, weighing just over 4lbs each. 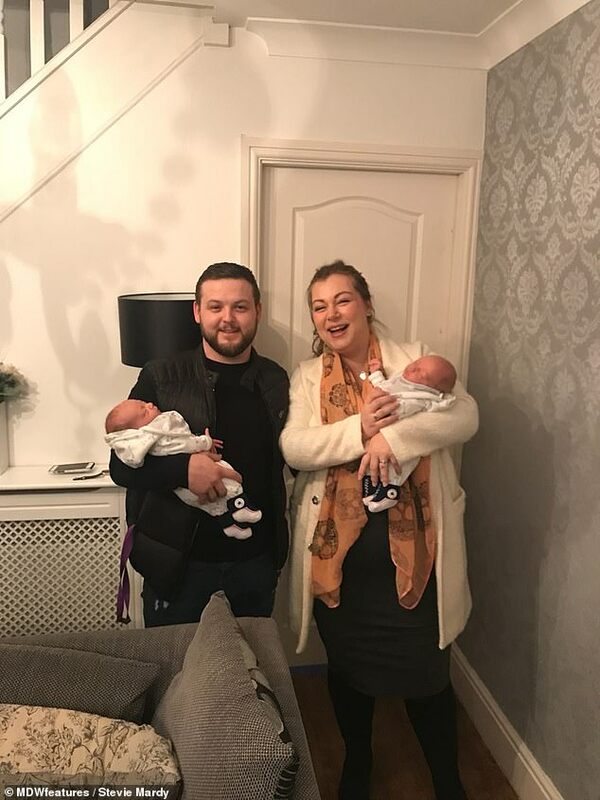 Branch manager Mrs Mardy, said: ‘They spent 13 days in NICU and six days in transitional care before coming home on my first Mother’s Day – I couldn’t have asked for a better gift. The couple were amazed to find out they were expecting twins during their first ultrasound in September 2017. But the sonographer requested a second opinion on something which concerned her. 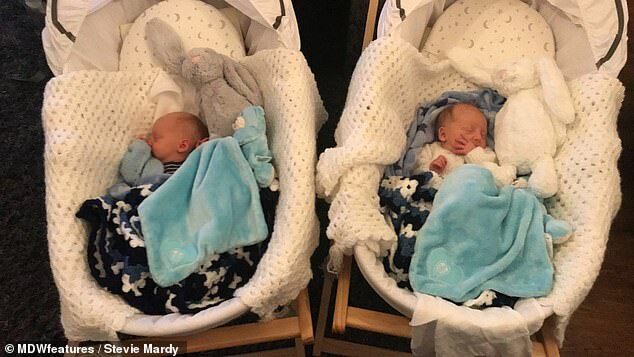 After a team of staff had observed the ultrasound, they explained that they couldn’t see a membrane and it was possible that the twins were sharing a placenta. Mrs Mardy said: ‘The team explained that they couldn’t see a membrane, which was extremely rare. ‘They expected that we may be able to see one at the next scan, so they booked us in with the twin team for two weeks later. ‘During those two weeks I wasn’t too concerned because they hadn’t specifically said they were MCMA and, considering how rare they are, they were sure at the next scan they would find a membrane. At this point, no-one had ever delved into how high the risks were. The condition is very rare, occurring in around one per cent of all twin pregnancies, according to the Royal College of Midwives. The high-risk pregnancy could cause the death of one or both babies, mainly due to the risk of the tangling or compression of the umbilical cords. They could develop twin-to-twin transfusion syndrome, when one twin receives the majority of the nourishment in the womb. 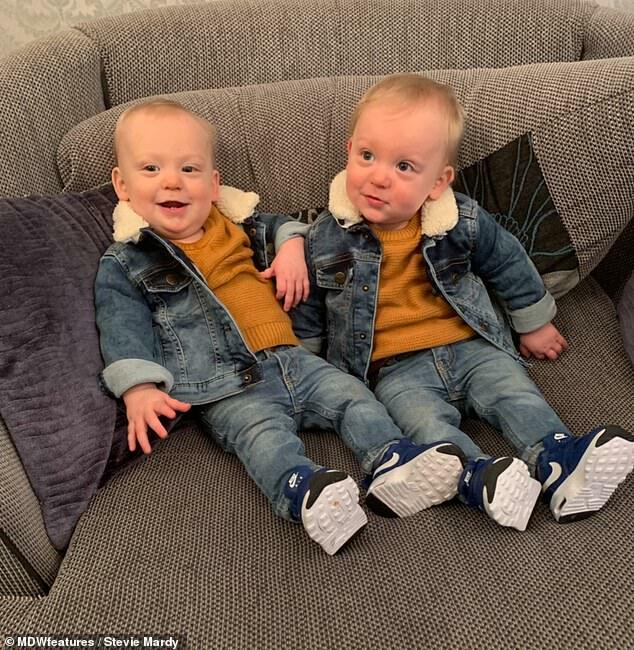 The couple had only heard of the condition once before as Karl’s mother had unfortunately lost MCMA twins in the past, which added to their fears. Mrs Mardy said: ‘This was heart-breaking to hear; we actually knew about the risks as Karl’s mum had unfortunately lost her MCMA twin girls at 25 weeks, prior to Karl being born. ‘I knew of my mother-in-law’s pregnancy with MCMA twins, but we had never really discussed it in depth. From 10 weeks onwards, Mrs Mardy received scans every two weeks to monitor umbilical cord compression and entanglement. ‘Our care plan from then on was pretty intense,’ Mrs Mardy said. ‘I was scanned every two weeks as the risk of umbilical cord compression and entanglement was high. 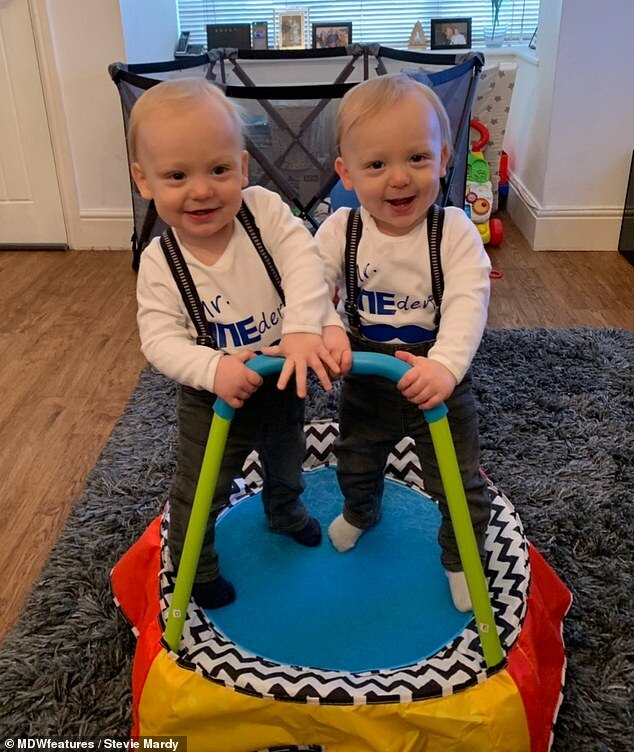 ‘Every Sunday night before I attended twin clinic I was awash with anxiety, hoping that there would be positive news the following day at our scans. 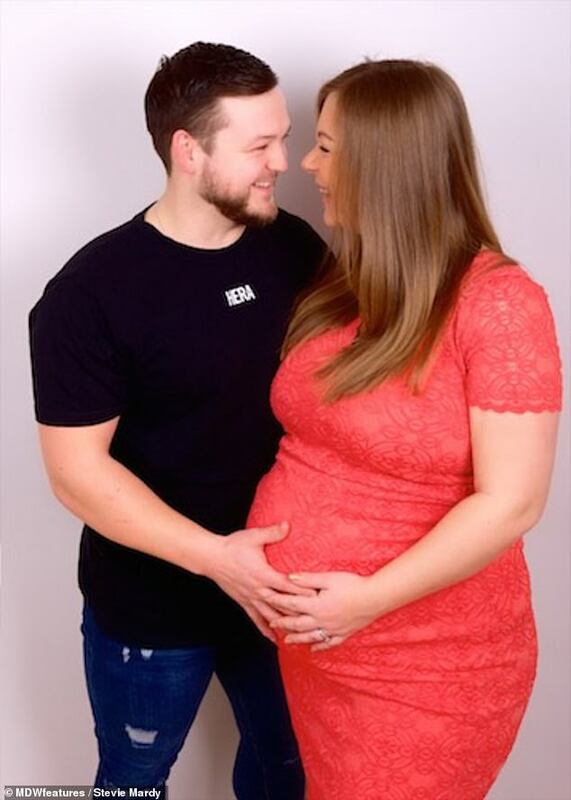 ‘Despite the risks, Karl and I tried our utmost to be optimistic in the face of adversity, especially when at every scan the consultant would reinforce the high-risk of my pregnancy. ‘There was one consultant in particular who used to scan me and he’d spend at least 15 minutes checking everything before he would say anything at all. A natural birth was ruled out and Mrs Mardy was told a C-section between 32 and 34 weeks was the safer option. However, the twins couldn’t reach full-term because the risk of them getting crushed was too great. The C-section was originally booked for February 16 but there wasn’t enough staff in the neonatal ward, so the delivery was delayed by four days, to ensure the babies were kept safe in such a high-risk delivery. 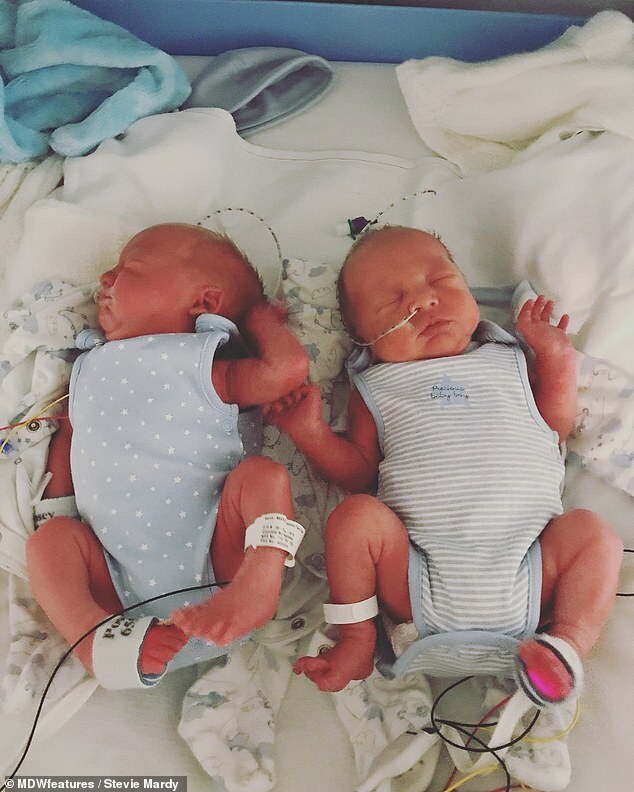 At 32 weeks and five days, Jenson and Quinton were born weighing 4lb 11oz and 4lb 13oz respectively, after a fearful nine months. 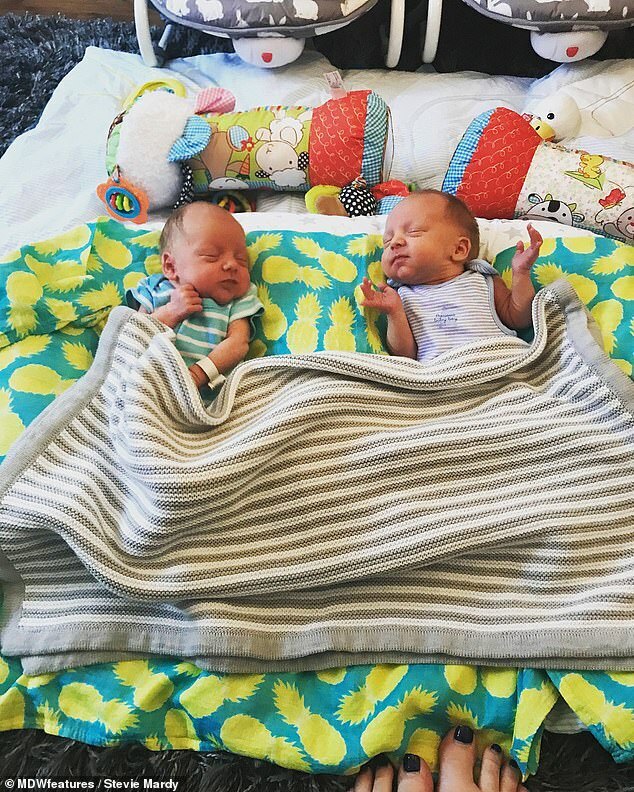 Jenson and Quinton spent 13 days in NICU and a following six days in transitional care before coming home on Mother’s Day last year. ‘Our boys were delivered safely by an expert team in the end. There were a couple of hitches with my spinal tap and epidural, so it took an hour and a half however,’ said Ms Mardy. ‘They had a little CPAP in the first 24 hours to help with their breathing. They also had some blue light treatment for jaundice. But other than that, they did so well. Ms Mardy wants to provide hope for parents who find themselves in the same position as her, after only hearing of MCMA twins once before. She said: ‘MCMA pregnancies are so rare, even the doctors and midwives have very little knowledge of them. ‘There is a MCMA UK Facebook support group which allows parents to share positive stories as well as give information and answer questions to newly diagnosed pregnant mums. ‘I would love to share the positive story of my boys and how amazing they have done considering the high risk of the pregnancy. To see more of the family’s journey, visit their Instagram page. WHAT IS MCMA IN TWIN PREGNANCYS? Monochorionic monoamniotic (MCMA) twins occur in around one per cent of all twin pregnancies. They arise when a single embryo divides, but if this occurs eight to nine days after fertilisation, they share the same placenta and chorion and are in the same amniotic sac. The main complication of MCMA twins is cord entanglement – regular two weekly scans should be made from 16 weeks, although more frequent scans will be needed as the pregnancy progresses. Because of the rarity and therefore limited evidence, there are no guidelines, which is why referral to a team with experience of managing at least several cases is the usual practice. Antenatal monitoring is aimed at survival of both babies – how this is best achieved is uncertain. Cord entanglement tends to occur during the early stages, so little can be done to prevent this. They may also compress one another’s cords, endangering their oxygen and food supply. Twin-to-twin transfusion syndrome can occur in monoamniotic twins. 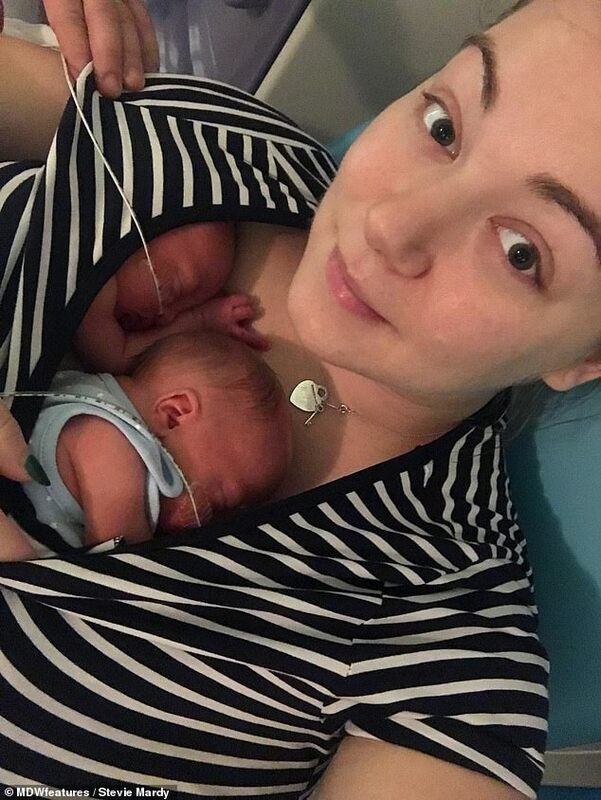 This syndrome happens when one twin receives the majority of the nourishment in the womb causing the other twin to become undernourished and sickly. All monoamniotic twins are born prematurely. This is because full-term pregnancy is deemed unsafe by most medical professionals. The survival rate for mono-amniotic twins is approximately 50 per cent.